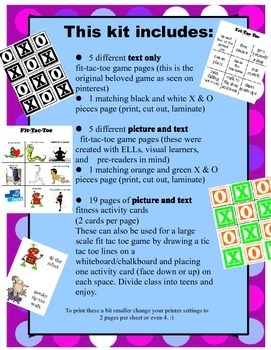 NEW AND IMPROVED FIT TAC TOE INCLUDES COLOUR PICTURES FOR PRIMARY STUDENTS, ELLS, AND PRE-READERS PLUS THE ORIGINAL BELOVED GAME! 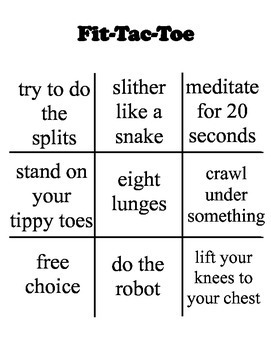 This game is played much like Tic-Tac-Toe except that instead of blank spots on your game board there are commands and you must perform the command listed on the spot you choose to place. -5 different text only game boards (they can be laminated or put into page protectors for re-use) and matching X and O pieces. 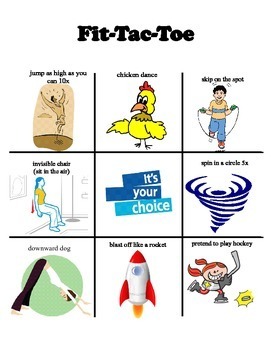 -5 different picture and text game boards (they can be laminated or put into page protectors for re-use) and coloured X and O pieces. 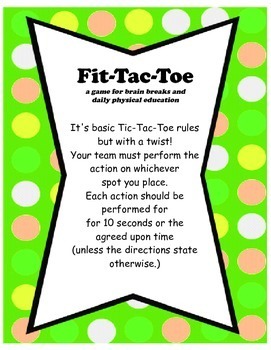 -19 pages of fitness activity cards which can be used as task cards or for use as an extra large, class sized game.